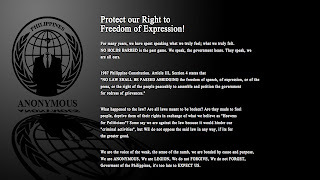 The National Food Authority’s (NFA) website was defaced Monday, January 14, to campaign Anonymous Philippines‘ position in the Philippine’s cybercrime law. This year, NFA is the second government website that was hacked in relation to the cybercrime law – the first being Senate Majority Floorleader Vicente “Tito” Sotto III’s site. 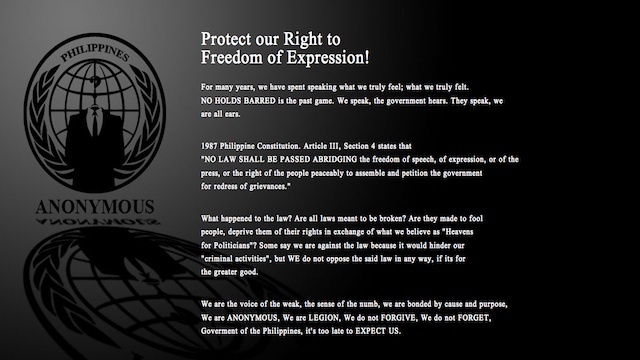 Tito Sotto’s website was defaced by the same online group, Anonymous Philippines, on January 8. As of this posting, NFA’s website is back though there are still missing images and links. Late last year, the court ordered a 120-day temporary restraining order (TRO) on the implementation of the cybercrime law. President Benigno “Noynoy” Aquino III signed the controversial bill into law (Republic Act 10175 also known as Cybercrime Prevention Act of 2012) on September 12, 2012 with the effectivity dated October 3, 2012. On Tuesday, January 15, the oral arguments will follow to discuss the constitutionality of the law at the Supreme Court.